The birthday spirit lives on around here, but the cake does not. Given one more chance to sing a Happy Birthday, I whipped up a second birthday dessert, this one a bit brighter and lighter than the first (Caramel Cake). There have been a lot of posts about sweets and liquor lately, but to be honest, that pretty much sums up the month of February around here. I did mention the “birthday month“, did I not? Meyer Lemon Pudding Cake is just the thing for a sweet wintery treat. A cross between a souffle and lemon curd, but so much easier to prepare. Prepare the batter and bake. As the cake bakes it separates into two delightful layers, a lemon pudding on top and an incredibly light and moist cake on the bottom. 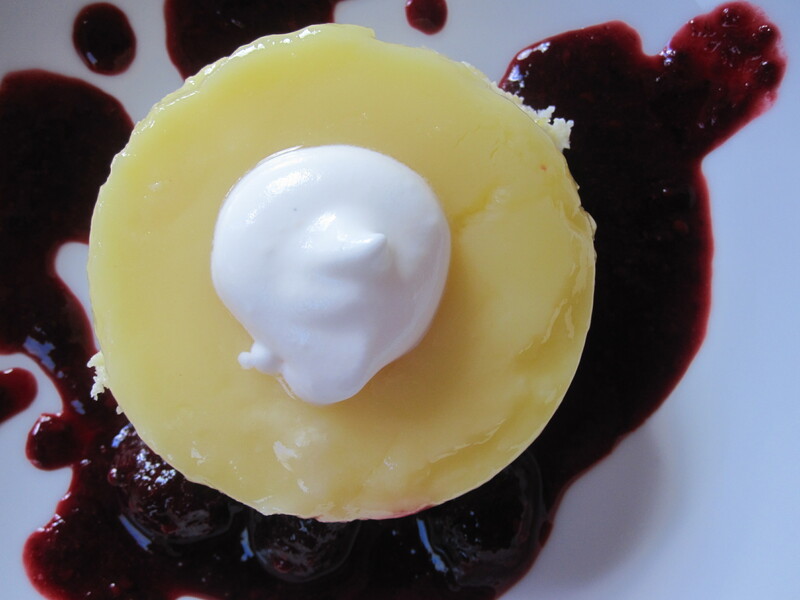 Serve with a gently sweetened berry sauce. I used ollalie berries from my parents bushes (thanks Mom! ), but blackberries, raspberries, even blueberries would be delicious. This can be made one day in advance, making it a great dessert for guests. Preheat the oven to 300 degrees. Butter and flour 4 6-ounce ramekins. Set aside. Separate eggs. Whip eggs with a pinch of salt until medium peaks form. Set aside. In a separate bowl, sift the flour and sugar together. This prevents the flour from clumping up when you add it to the rest of the mixture. In a medium sized bowl, mix the lemon juice, egg yolks, zest and buttermilk. Fold the flour mixture into the buttermilk mixture, then gently fold in the egg whites until just combined. Fill the prepared ramekins to the top with the batter. Place filled ramekins in a casserole dish. Place casserole dish on the middle rack of the oven. Pour hot water into the casserole dish so that the water level reaches half the way up the sides of the ramekins. Cover with foil and bake for 25 minutes. Remove foil and bake an additional 10-15 minutes, until slightly browned on top. Remove from the water bath, cool, then chill until needed. Can be made one day ahead. Toss the berries with the sugar and let sit until fruit is soft and syrupy. Puree half the berries. Mix the puree with the whole berries. Invert the ramekin over plate and gently tap the bottom. The pudding cake should drop out. If necessary, run a knife around the edge to loosen the sides. 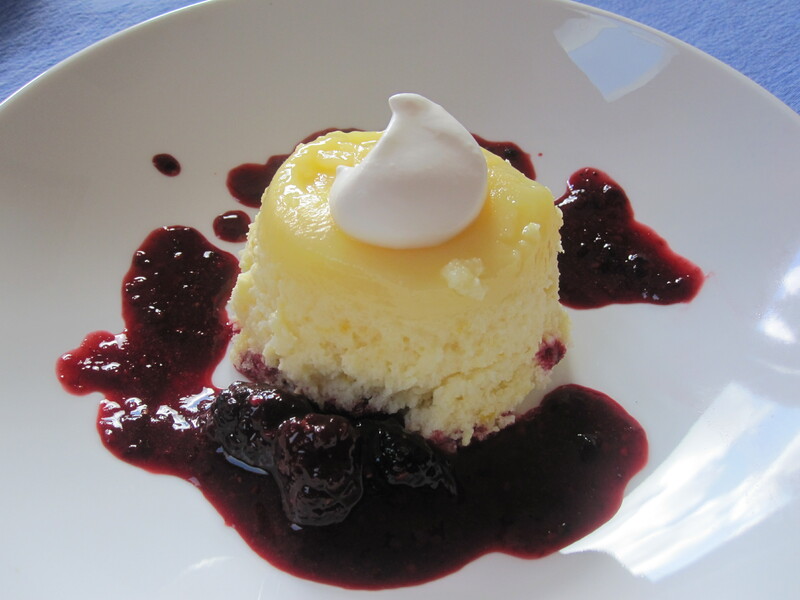 Spoon berry sauce around plate and top with whipped cream. Yes, Vinny. This recipe is a nice retreat from super rich and decadent desserts. I hope you enjoy it! This is brilliant. I like the mix of textures. I will surely make this. Thank you, Lynda. I hope you do try it and let me know what you think! Very interesting – looks amazing. Lemon desserts are one of my favorites! Lemon Pudding Cake is probably my all-time favorite dessert!! I’ve never used Meyers in them, but will do so now. I’ll be making yours really soon. LOVE these. 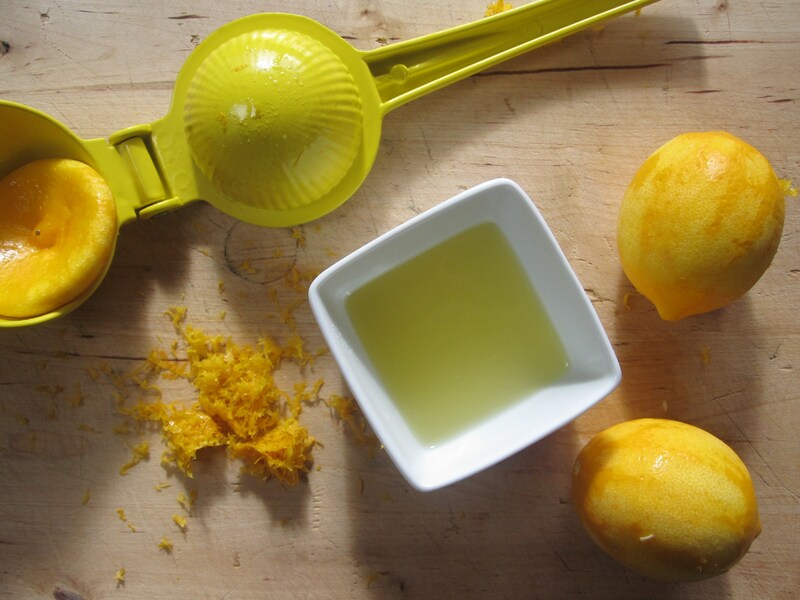 Always looking for a new Meyer Lemon recipe. This is definitely on my list. ps Dad helped me tie up the Ollalieberries — good news for summer time. What a beautiful dessert! I do love lemon sweets – actually, lemon anything! I’m intrigued by your ollalie berries…haven’t had those before and they look delicious.